Have you ever spent hours upon hours of research for a book you're writing? Maybe even begrudgingly? I just want to write! Why do I need to stop and research? Even for just a single sentence? I spoke with a library friend of mine and she said how beautiful my book will be for it. I am careful not to write in gross detail in the work as it is background knowledge, but shines through the dialogue, mentioned casually in setting as well as description. For Musketeer's Daughter, I have spent over 10 hours on research during King Henri IV of France's reign from his favorite castle of residence to fashion, food, and weather. Castles undergo lots of construction and rebuilding as well as tearing down and sometimes it's difficult to find out just how and what and when! 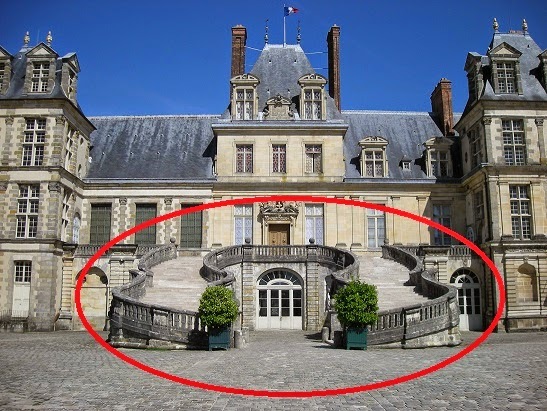 Below is the famous horse shoe staircase of Chateau de Fontainebleau during Henri IV of France's reign. 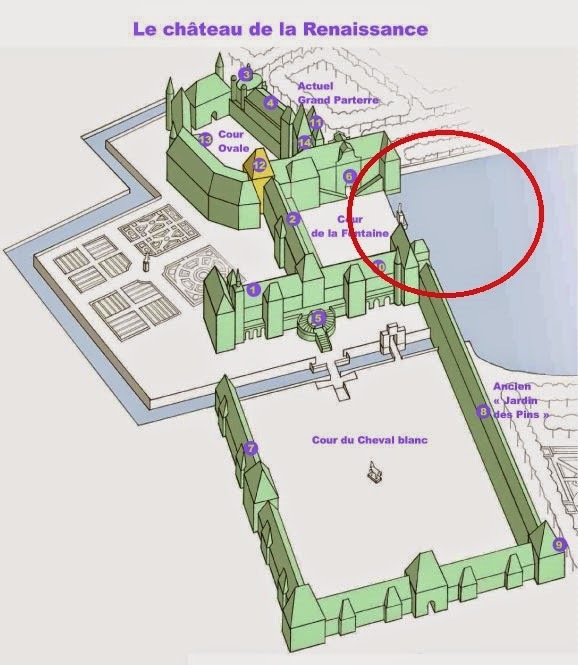 The drawing was done before 1610, while the photograph of the same castle happens to be of the staircase after his son, Louis XIII, had them reconstructed (how they are today). 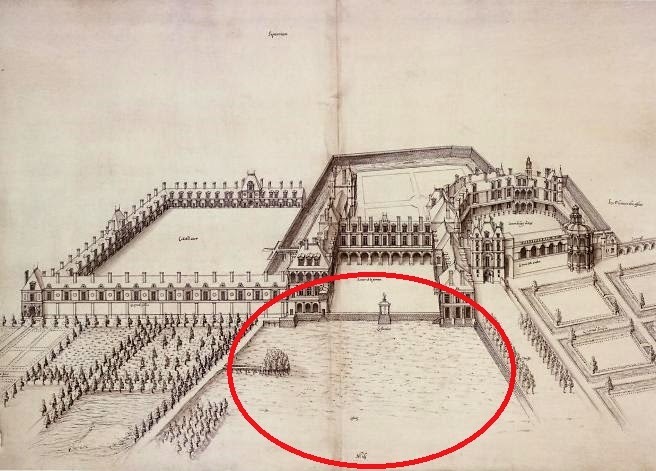 Something that I learned during my studies is that King Henri (reigned 1553-1610) commissioned a floating garden in the castle's fishing lake. Can you see it below in the the illustration? 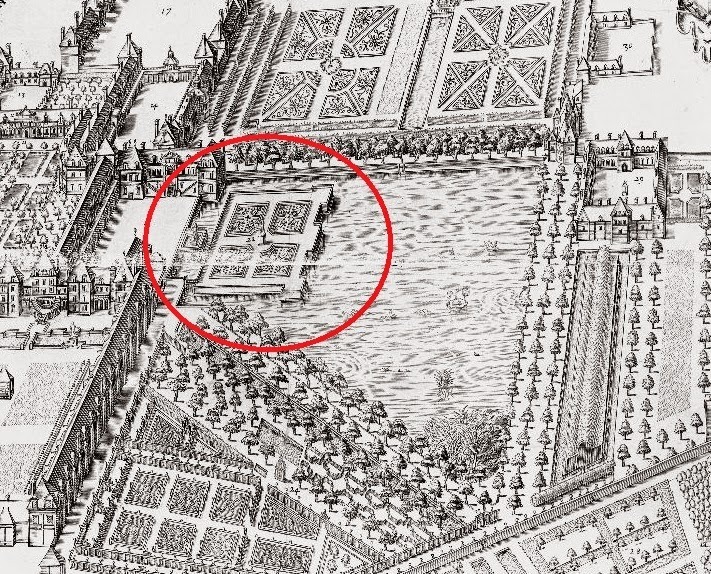 There are only a few illustrations of this garden via bird's eye view like the one below. But somehow, it mysteriously vanished in a few years' later illustration (Jacques Androuet de Cerceau in 1570--not too long after). So where did it go in such a few short years? In the modern illustrations as well as photographs, the garden is not there. I was disappointed to see it missing and wondered what had happened to it. I spent several hours more trying to unearth a record on where it went. Well, I never found such information, but a closer look via satellite showed much to my shock! 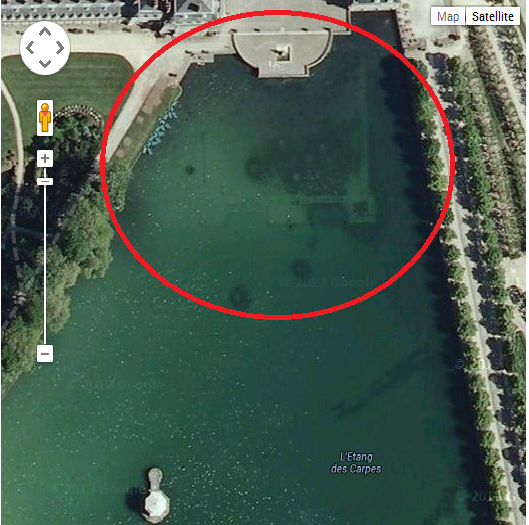 Do you see it right there (below), beneath the Lake? Yes, it sank! 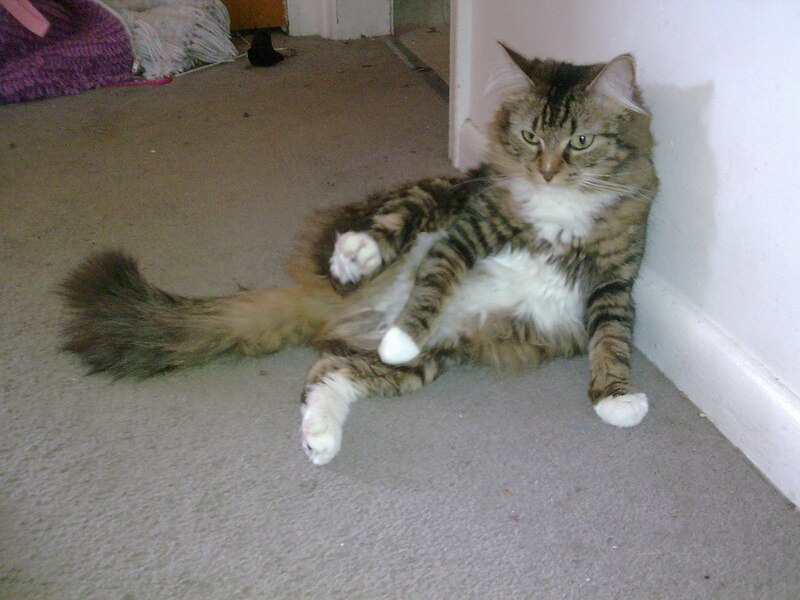 Still, after discovering where it went and how, I could not find anything about it. Surely the people were scared that something so solid and well-used had sunk right before their eyes? Maybe someone had it destroyed because it was too dangerous or was just spiteful, and thought it not worth recording? Who knows... There is more out there and wish I could find the records. What sort of interesting facts have you found while researching? 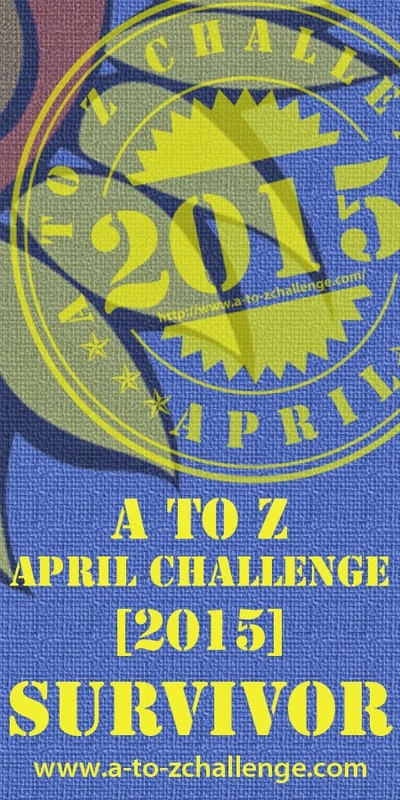 Last week I shared with you how daunting it has been for me. As I read the post title and viewed the number of impressive hits, I realized something...everyone is hungry for knowledge; you were hoping to find some helpful advice but maybe were disappointed when my post mentioned just how lost over it I was! Another thing I realized is that I've been searching for "See a need, fill a need." What about, "See a want, fill a want"? Aren't wants just as powerful as needs? People are constantly seeking comfort and joy, right? Plus, if I follow my drive to obey what I want to post rather than what I need to post, it will reflect honesty and not feel forced. Writing a blog post is very much like writing a book: always keep your eyes open for inspiration: One day I was driving down the street and saw a car with a right-seated driver. I have never seen a right-seated car before and it stuck with me. Another was when the wind blew so hard, it tossed my tent from my yard. We searched the neighborhood and couldn't find it. Guess what? It was in my backdoor neighbor's yard! Writing your post short and snappy (like the bikini method--small enough to keep it interesting, but cover the important details) makes for a great post! I enjoyed the helpful comments left on my other post, if you're interested in reading them! How do you find your inspiration for your blog posts? What tips do you have that work great for you? Though I have always enjoyed writing, words became deeper and more meaningful the day my Language Arts Instructor (high school) had us read this classic: A Worn Path by Eudora Welty. I was instantly impressed by her enigmatic way of unraveling the tale as well as the rich sensory detail and the implied history! My! For your benefit, I have posted the story below the break. I hope you love it as much as I do. Do you love her style? Hate it? Why? Congrats, Shanna M. Tull! I loved this book back when I critiqued it, and I love it even more now. Woohooo!!! Fortuna, a determined young lady, wants nothing more than to prove to everyone that a middle princess is just as special as the firstborn and last daughter. She has the perfect quest too. Shortly before her eldest sister’s wedding all of the princes disappeared. If she finds the seven missing men she’ll not only be a hero, but she will have saved her sister’s love lives and exonerated her kingdom from blame. Forced to run away to go on her quest, Fortuna has to accept the company of Aaron, a handsome young man who has sworn to protect her, a crazy old lady who thinks Fortuna is her daughter, and a traveling troupe who want nothing more than to hide her away and keep her safe. 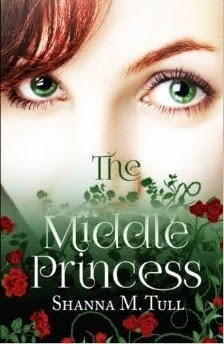 As she and her companions confront camping out at night, music-loving ogres, and fairies who aren’t telling Fortuna everything she is faced with decisions that could alter her entire world as she realizes that Aaron might be someone more important to her than any prince could ever be. Will Fortuna follow her heart and doom not only the missing princes and her sisters, but her kingdom as well? Or will she be a true princess and prove to everyone, for once and for all, that a middle princess is special too? I think it should be whatever comes to your heart. I know when I started several years ago, I wanted to sweep you off your feet with interesting topics. So I wrote every single day of the week--Sundays included--with patterned specific themes. That became tiresome. 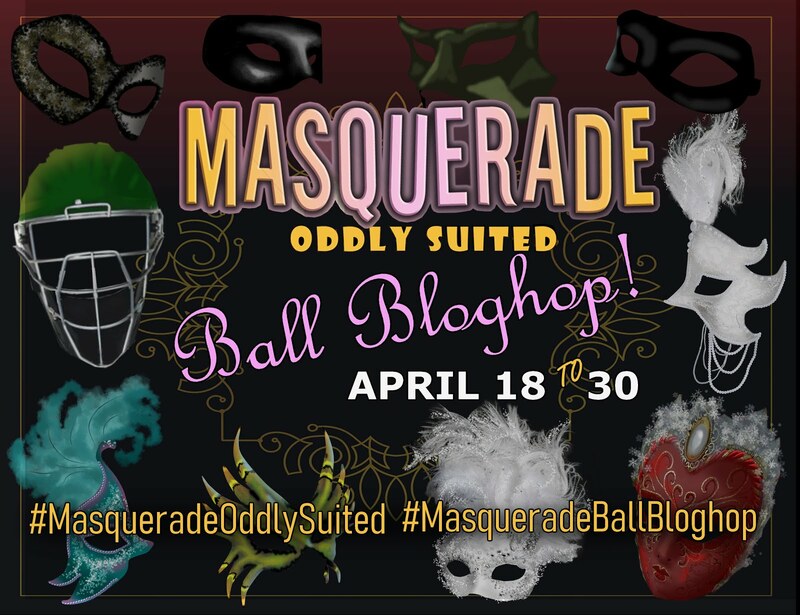 I held blog tours as well as guest posts and threw bloghops and other innovative events. It was fun! But maybe I tried too hard? I can't compete with that now! Ha. Now I scratch my head in wonder with what interesting topics I can come up with for you. 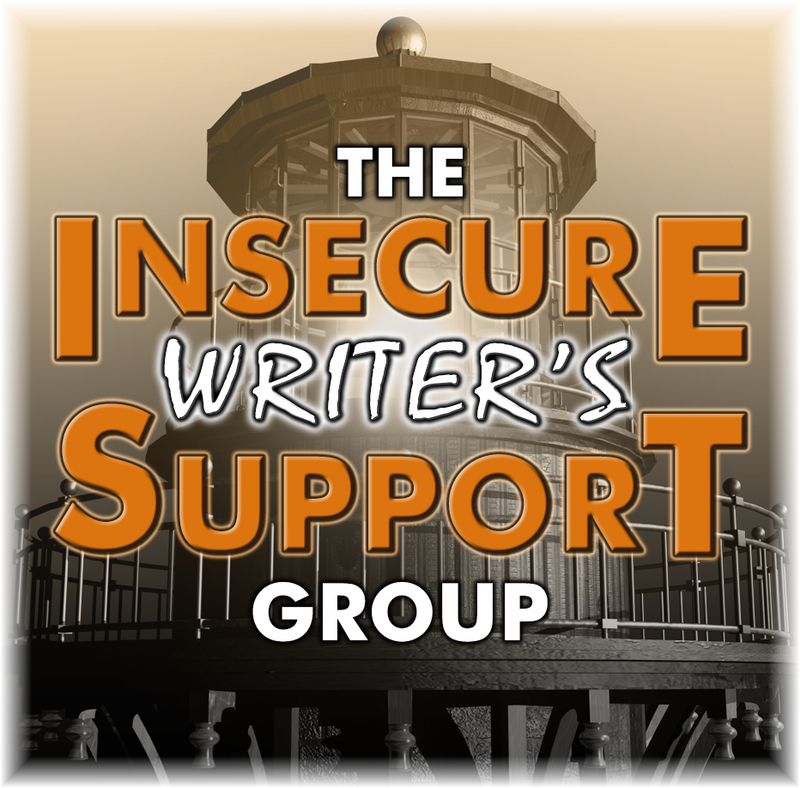 With audience in mind, I become paralyzed and then I lose myself in the 'rules' of what should please you (I have gone to writers conferences where they share with us on how to make your blog work for you). Oh boy... On top of that, I am bloggified out after more than a year when babykins has been born. Have you lost yourself in topics that would lure readers to your blog? Or do you just write whatever comes naturally? 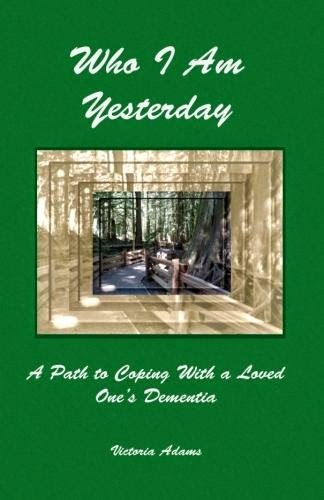 This book is my personal journey through the first year of learning to manage the day to day joys and tribulations of living with a loved one's dementia. It is a personal story which provides the foundation of the relationship that I have with my husband. It is also a journey of observation; a tale of learning and discovery, and a sharing of the coping mechanisms that worked for me. Join me as I follow the incredible workings of the human mind and learn how to find humor in the midst of heartbreak. Who I am Yesterday: A Path to Coping with a Loved One’s Dementia by Victoria Adams is a touching account of her efforts to care for her husband through the advance of his confused mental stage. Victoria gives detailed information about practicalities of living with someone who has vascular dementia and gives realistic advice without getting bogged down in complicated medical and legal details. An engaging and unique viewpoint on dementia care-giving. Victoria captures the reader with her capacity to communicate and relate with her loved one's changing needs. To say this is a "must read" for care-givers would be an understatement. This is a must read for anyone who is affected by dementia- especially their care givers. The author makes a case for dementia and how it affects the lives of those it touches in both the good times and the difficult times. For anyone who has been a care giver, family member, friend or loved one of one with dementia he or she will relate to the stories in this book which will make you laugh and cry. The author takes you on a journey of love, of hope, and of courage. ... watch me rise from the ash. Ouch! I hope I don't burn up again. How do you reconnect when you have been absent for a long time? Coming NEXT week: Who I am Yesterday by the fabulous Victoria Adams!